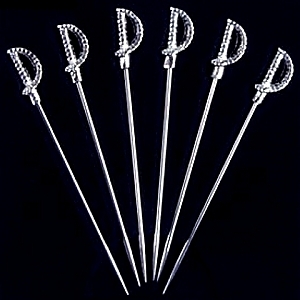 Serve the perfect martini in swashbuckler style with these high quality sword martini picks. These handsome martini picks have realistic looking stainless steel sword blades with fine pewter handles. The set of 6 comes packaged in an open window box. Buy 3 sets and save 10%. Thats only $9.85 each!